A Houses from Within gathering at the S. Horowitz & Co. law offices. A dazzle of color is the visitor’s reward for climbing four flights of stairs to take a peek at this duplex overlooking the Mediterranean Sea: a sitting room of canary yellow with rose-colored couches, a hot-pink bathroom and a dining area accented by swirls of silver paint. The laundry room is lime green. The owners, a retired couple, have a bold art collection, much of it oil paintings on large canvases, and the blue of both a rooftop pool and views of the shimmering Mediterranean across the road round out the mélange of colors. The spacious apartment is in a Bauhaus building and features porthole-style windows meant to be reminiscent of those on steamships, in keeping with an industrial look. Locals and a few tourists made the journey to 2 Donnolo Harofeh Street in Jaffa’s seaside Ajami neighborhood in 2011. They were taking part in what has become an annual rite of passage in May here and in Tel Aviv: Batim Mibifnim, Houses from Within (www.batim-il.org), the architectural showcase weekend. Hugely successful, Houses from Within is an Israeli spinoff of Open House; there is also a Houses from Within in Jerusalem, which takes place in the fall. Held in various cities around the world for one weekend a year, Open House (www.openhouseworldwide.org) invites the public inside homes of notable design and provides behind-the-scenes tours of landmark public buildings and urban spaces. Israel’s version of Open House began in 2007 with about 20,000 visitors and 49 sites. Last year’s event, which had an environmentally friendly theme, showcased 140 venues and over 80,000 people showed up; waits were commonly up to an hour long to get into private residences, consistently the most popular attraction. The 2012 program, May 18 to 19, is part of the city’s Art Year. 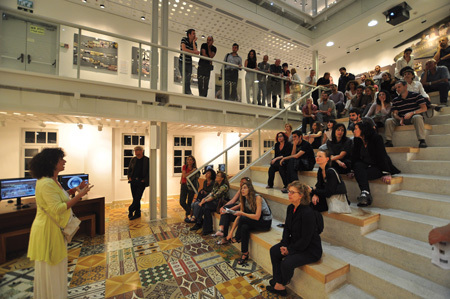 Over 150 venues and tours are included, from an archaeological tour of Jaffa’s Lower City to the angular, modern Herta and Paul Amir Building at the Tel Aviv Museum of Art. The museum’s new wing, a five-story building opened in 2011, has attracted both visitors and critical praise. It was designed by Preston Scott Cohen, chairman of the Harvard University Department of Architecture. “I come out of curiosity to see renovations and what might be revealed inside buildings we see from the street,” said Irit Shapir, a chemist from the Tel Aviv suburb of Kiryat Ono, who attended the 2011 Houses from Within. “Buildings are an important part of our cultural lives.” Shapir sat on the stairs outside a pristinely restored building on Rothschild Boulevard, one of the city’s oldest streets, holding a thick pamphlet of the houses and buildings that were open for the event. “So many of the buildings on view have historic status, and it’s a chance to absorb some of the city’s history, which has moved at such a lightning pace,” she added. Alon Bin Nun, the architect who founded Houses from Within with his wife, Aviva Levinson, said that although Tel Aviv is now internationally celebrated for its architectural bounty—particularly its trove of Bauhaus buildings from the 1930s and 1940s—and its hip and playful urban landscape, today’s view of the city have changed. A Houses from Within at an art gallery. Photo by Ron Henzel. An important moment for the city came in 2003, when Unesco declared Tel Aviv’s concentration of Bauhaus architecture a World Heritage Site, known loosely as the White City. In the 1930s, Jewish architects fleeing the Nazis in Europe brought the Bauhaus, or International style, with them, and its socialist-minded, functional form found a home in Zionism’s goal of a new, egalitarian utopia. Houses from Within is a showcase for more than just homes. In 2011, public buildings from new underground hospital facilities and an innovative cardiology tower at Tel Aviv Sourasky Medical Center at 6 Weizmann Street were on display as was a public nursery school at the Remez-Arlozorov Community Center on 95 Arlozorov Street and the Tel Aviv-Jaffa firehouse at 231 Ibn Gabirol Street, which includes an observatory that overlooks the entire city. Also on view was the country’s first green high-rise building, at 34 Hamasger Street, which has systems for recycling air conditioning condensation and collecting rainwater among other energy-saving features. Innovative workspaces also got a showing, including the airy S. Horowitz & Co. law offices at 31 Ahad Ha’am Street, the studio of musician Haggai Yuden at 27 Schocken Street with his 150-year-old white piano and the offices of a software developer at 2 Tasach Street, which has a boxing ring and a swimming pool surrounded by workstations. A key feature of the project is to prompt discussion of urban development and, in particular, how to create a more accessible and exciting city. 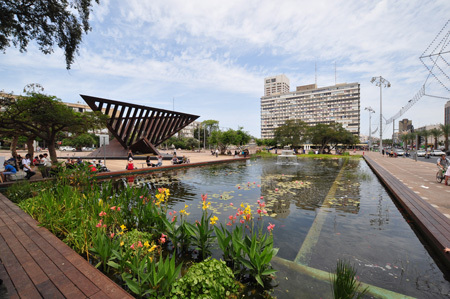 To that end, a lecture and debate last year were offered on the proposed options for lowering Dizengoff Square, one of the city’s main centers, and a talk by Avi Levi of the city’s beautification department about the renovation of an ecological pool in Rabin Square. For decades, the long rectangular pool had been hidden by shrubs. It was recently restored and, with its lily pads, goldfish and cluster of chairs lining its sides, instantly became a major draw as an oasis of calm in the middle of the city’s bustle. Key historic restorations of public buildings are a highlight. 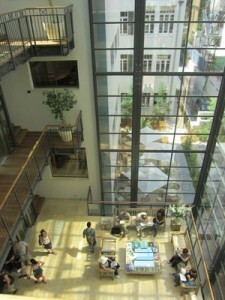 Houses from Within 2011 included a tour of City House at 27 Bialik Street, a stately white 1925 building with a portico that served as the original city hall for Tel Aviv and is now a museum dedicated to the city’s history. Next door is the Bialik House, home of Hayyim Nahman Bialik, considered Israel’s first national poet. The home underwent an extensive renovation, its rooms restored to their original vibrant greens, blues and reds. David and Paula Ben-Gurion’s Tel Aviv home, at 17 Ben-Gurion Boulevard, which has been on the weekend’s schedule for the past several years, impressed crowds, both because of the couple’s simple lifestyle and their extensive library. The Rabin Square ecological pool. Photo by Ron Henzel. Among the most popular homes on display in 2011 was a snug 780-square-foot garden apartment at 23 Bnai Zion Street in central Tel Aviv designed by Romi Silber, a young interior designer who created the space for her expanding family. The line of people waiting to explore it stretched down the tree-lined block. The entrance, down a path of paving stones and behind a nondescript concrete building, opens to a sun-drenched garden lined with white and purple impatiens, whitewashed walls and flowering trees. A newspaper was spread out on a long wooden table surrounded by benches. Slipping through the sliding doors, visitors inspected its meticulously planned layout to view the creative use of space. A narrow galley kitchen features sleek, gray countertops, a stainless-steel tabletop with wooden legs, a mix of vintage and shiny metal chairs and a 1950s cupboard from the Jaffa flea market. The living room, once dark and cramped, now opens into the garden. A round, polished wooden table in the room next to the sliding doors gives the feeling of being inside and outside at the same time. “We found the potential of the space and brought the garden into the apartment,” said Silber, a slim young woman with thick maroon plastic glasses. She, like others, many of them architects or interior designers, open their houses in part to generate business. But, in general, there is a desire to share the delight of their innovative homes with the public. “I live across the street and never imagined there was anything like this here,” exclaimed one woman. The wonder of exploration and discovery of one’s own city is what led Victoria Thornton, the founder of Open House in London, the first of the Open House weekends, to launch the concept in 1992. It started with 20 houses and within two years grew to 400. Now there are 700 venues on display with a quarter of a million people participating each September in London. “Everyone owns it, they feel they belong to the life of the city…its an opportunity to look at their own city, to take it back and enjoy it,” said Thornton as she set out for a day of seeing Tel Aviv’s version of the project with other visiting Open House directors from around the world. The directors gathered as a group for the first time at the 2011 festival, sharing notes and discussing the program at a daylong conference. Open House programs are currently held in 13 cities, from Brisbane to Barcelona. “All of the mayors realize it’s about engaging the citizens and using architecture as a way to have a conversation,” said Thornton, noting that more and more cities are hosting future Open House weekends, including Rome, Chicago, Lisbon and several in South America. Photo by Limor Zur-Magen/Courtesy of HESEG House. 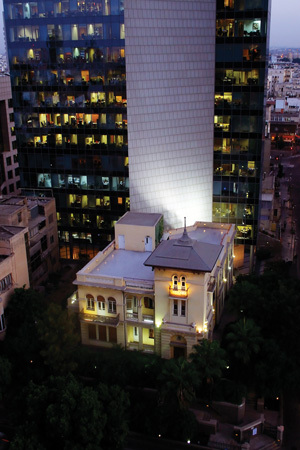 One of last year’s favorite tours was the landmark building at 46 Rothschild Boulevard, built in 1924 by Zvi Levin, a Latvian-born American Jew; a philanthropist, he worked to promote aliya among Americans at a time when the concept was almost unimaginable. The pale-yellow mansion with Arabic-style arched windows is dotted with balconies and encircled by towering palm trees. After several incarnations—it had served as the Soviet Embassy and as an auction house for Sotheby’s—the mansion is now headquarters of HESEG, an organization that aids immigrant soldiers of the Israel Defense Forces. Aviv Bushinsky, HESEG’s director and a former spokesman for Prime Minister Benjamin Netanyahu, gave tours of the building over the weekend. Bushinsky spoke to a group of some 70 people who had passed through the building’s carved wood doors to cram into its lobby, which was flooded with sunlight pouring through a series of arched windows. He told stories about the house, once the headquarters of the Haganah, Israel’s prestate militia. The building and its garden recall an era when the city featured an eclectic mix of architecture and was a quieter, smaller place, trafficked by horses and the occasional automobile and inhabited by only a few thousand people. Outside, the venerable building meets modern Tel Aviv: It abuts a skyscraper of reflective glass squares designed by I.M. Pei. At 6 Rothschild, people joined the growing line to get into an 1,800-square-foot loft, where a long white leather couch stretches out in front of a series of rectangular windows designed by its owner, architect Uri Pelen. On an adjacent wall, a shelf has been fashioned from a rubble of rocks enclosed by wire meshing. The rooms are sectioned off by glass walls and a deep, oblong bathtub rests at the foot of the bed in the master suite, off of which is a bathroom without walls.